Sew Let’s Quilt Along has started! 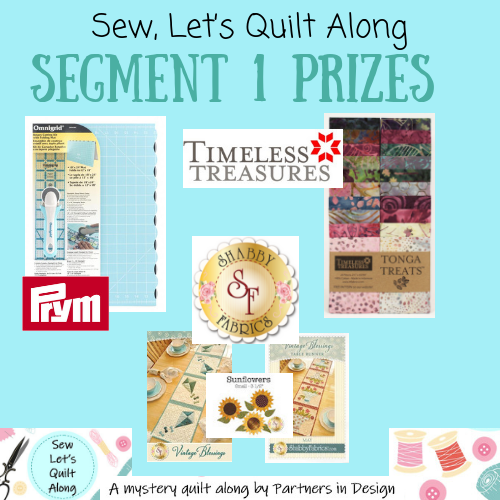 It’s a free, sewing-themed mystery quilt along, and I’m so excited to share our first block with you. If you missed the intro, you can get all of the details here. I also have a handy dandy quilt along page with links to each block as it comes out. Our very first block is a sewing machine! I don’t know about you, but I don’t think there’s any better way to kick off a sewing-themed quilt along than with a sewing machine. And Sandra did a fabulous job designing this one. She even included embroidered details to make it look more realistic, but I opted to leave those off of my block. Head on over to Sandra’s post to get the pattern. All of our block patterns will be free until the quilt along ends on September 24, 2019. I always think choosing fabrics is one of the hardest parts of making a block, so I was excited when my choices came together pretty easily this time. I started with the machine and table fabrics. Since there’s so much fabric in the machine, I wanted something with a lot of movement and variation of colors. Once I had that, I wanted a lighter fabric for the panel. From there, it was easy to find fabrics that went with the rest. Since the spools are so small, I was able to use some of my extra tiny scraps! The right tools make everything so much easier. Since some of the pieces in this block are pretty small, I heavily starched all of my fabrics with unscented Best Press before cutting. I used small office labels to keep track of my pieces, and a Sewline ceramic pencil to draw the lines on the stitch-and-flip squares. Finally, I pulled out my pack of Steam-A-Seam for fusing the knob on the machine. This was my first time using Steam-A-Seam, and I think I’ve been converted. It was so much easier to work with than Heat-N-Bond. Some of the pieces in this block are only 1 1/4" square. To keep those short seams from pulling apart, I recommend using a pretty short stitch length. I set the stitch length on my Viking to 2.0, which is about 16 stitches per inch. As I was cutting, I labeled each piece with its letter or number from the pattern. That made it so easy to be sure I picked up the right pieces when it was time to sew! To make sure nothing got lost, I arranged all of my cut pieces on a baking tray. I inherited this tray from my grandma, and it lives in my sewing room for just this purpose. I generally avoid pinning, but some of the seams in this block are pretty long! I find that pinning long seams makes a huge difference in my finished block. You can press the seams in this block any way you would like, whether that’s open or to the side. Since I prefer to press to the side, I put a little bit of thought into the best way to press all of the seams. If you would like to press the same way I did, here’s a diagram. And here’s a peak behind the seams. I was pleased that everything laid so nice! Before I fuse the Steam-A-Seam to my fabric, I like to cut out the centers about 1/2” from the edge. This helps keep the applique from getting too stiff. Sometimes I will nest pieces inside each other to save on fusible, but these circles were a bit too close in size for that. Here’s a look after fusing. I make sure my fabric is a little bit bigger than the fusible web so I don’t end up with any sticky residue on my ironing board. I found it easiest to fuse the center onto the knob before moving it to the block. That way I could deal with the whole knob as a single piece. Sometimes I find it pretty challenging to get the paper to peel off. If you score it with a pin, it makes it so much easier to get started! I wanted my knob to be centered horizontally on my sewing machine. I pulled out an acrylic ruler and lined it up with the center of the knob. I played with the placement until I was happy, then fused it in place. It’s important to stitch around your applique so you can be sure it will stand the test of time. You can use any stitch you would like. Zigzags and blanket stitches are both popular options. Personally, I went for a simple straight stitch just inside the edge. For best results, choose a thread that blends. I used Aurifil 1148 Light Jade in the blue, and Aurifil 1147 Light Leaf Green in the green. I used needle down option on my machine and went slowly. I frequently lifted the presser foot to adjust the fabric in order to keep the stitching going nicely along the round edges. If you’re nervous about this part, just take your time. It’s easier than it looks. We have nine hosts for segment one, and we all made our very own sewing machine blocks. Be sure to visit all of the lovely ladies below for more tips and inspiration. If you like what you see, leave a comment! We all love a bit of encouragement from our fellow quilters. I hope you’re excited about this week’s block! I certainly can’t wait to see everyone’s sewing machines. Please remember to share your pictures so we can all cheer each other on. 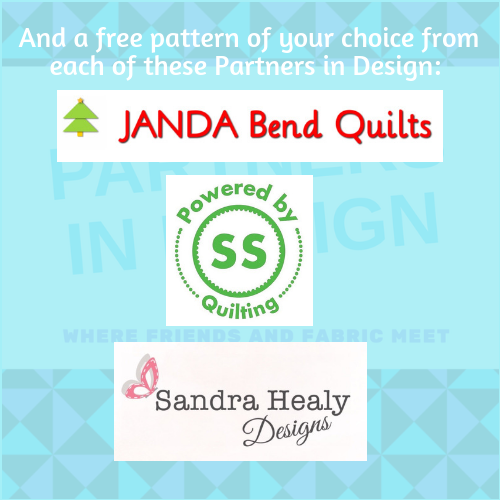 You can share in the Partners in Design Facebook group, or on Instagram with the hashtag #SewLetsQAL. Posted on March 11, 2019 by Bobbi Bridgeman and filed under Quilting, Quilt Alongs and tagged Partners in Design Sew Let's Quilt Along mystery quilt pieced quilt block applique.